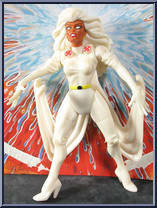 Orphaned on the streets of Cairo at a young age, Ororo Munroe grew up to become the X-Men leader Weather Fury Storm! Controlling the elements with her thoughts, Storm creates hurricane winds and lightning bolts with ease. Possessing wisdom gained from a lifetime of hardship and adventure, Storm is one reason why the X-Men continue to be victorious in their never-ending battle against the forces of evil. Contribute pictures, update details or suggest corrections for Storm (Weather Fury). Write a review about Storm (Weather Fury).